Hello Friends, I am running late today so I am going to make this short and sweet! Judy is our Hostess at Just Us Girls and she has picked Shiny as our trend this week. Not sure you can tell by my terrible photo but the hearts on my cards are made from Silvery glitter cardstock. 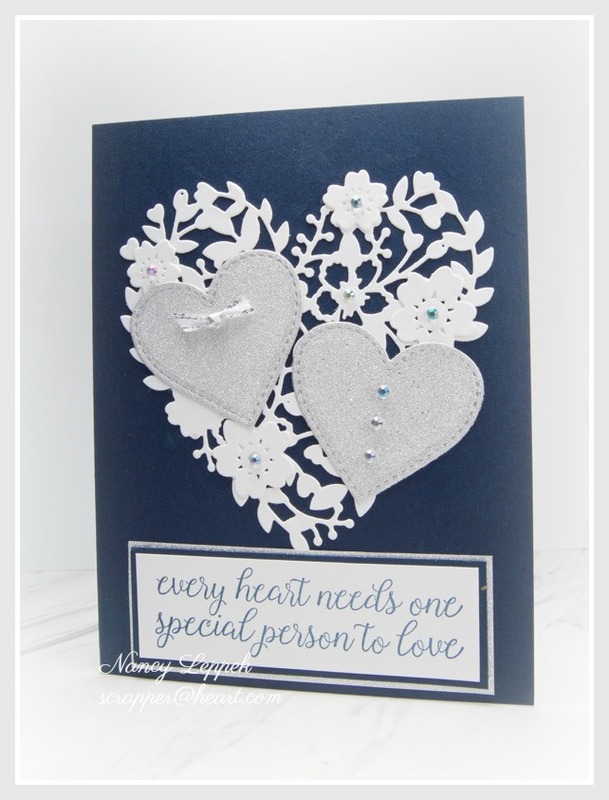 The fabulous sentiment and Heart die are from Stampin Up, and the hearts are MFT. Categories: Cards | Tags: Card making, Cards, rubber stamps, stamping, Stamping Up | Permalink. Nancy, this is so sweet. I love the simple design, but says so much. This is a gorgeous wedding card, Nancy. I love how you ‘dressed’ the hearts. Beautiful card and great take on the challenge. LOVE how you have used that gorgeous intricate heart die, and then the pretty glittery hearts on top are just perfect. So cute that they are “bride and groom” hearts. Very clever and oh, so fabulous! So pretty! I love how you have the hearts layered – it’s just perfect design for the sentiment, which I LOVE!!! Really gorgeous creation! This is a fantastic wedding card design. I just love those colors too. So so pretty Nancy. Beautiful card and perfect sentiment. I can imagine how shiny those hearts are. Shame shine is so hard to photograph and always is so much nicer IRL. What an elegant card! Love those shimmery and shiny hearts! Beautiful! I love the little bride and groom hearts against the bigger floral heart. That sentiment is awesome, too! A perfect wedding card!